Is your new years resolution making you sore? For those of you who suffer from muscle pain, whether it be from working out, some form of sports, hard physical work, or whatever... sometimes you don't want to pop too many pain pills. Thanks to BENGAY®, that may be possible for many of us. 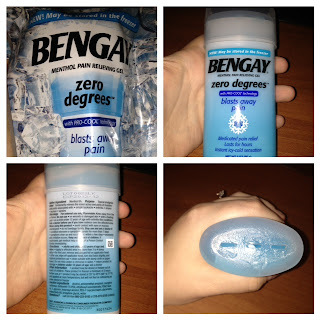 The company has a newer more advanced product: BENGAY® Zero Degrees. It's a Menthol Pain Relieving Gel with PRO-COOL™ technology. What does that mean? 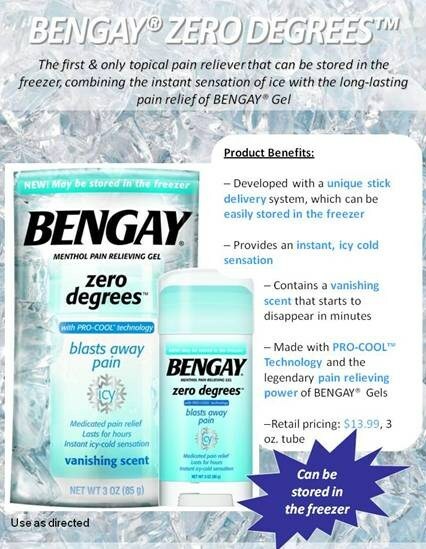 It's the first and only topical pain reliever that combines the icy-cold sensation of ice with the long-lasting pain relief of BENGAY® medicine. The gel may be stored in the freezer to provide the instant sensation of ice and its powerful PRO-COOL™ technology that lasts for hours. I loved the fact that with this product there was really no need to apply it using your hands. With it being packaged in a deodorant-like bottle, it makes it super easy to apply. When you're at home it's easy to apply, being able to rub the gel into your skin for an added pain relieving massage. But what if you're out, and you don't want to get your hands messy? Well, with this applicator, it's not necessary to rub it into the skin like many other products. Even though I enjoyed this product, I ended up giving it to my grandmother. I had it in my purse one time when I was there, and she had incredible back pain. She has back problems, and at times is counting down the hours until she can take another pain pill. I decided to massage some of this product on her lower back to see if it would help, and it helped a lot. Of course it didn't fix her back pain completely, but it did freeze it enough that she was able to actually move around. Her back pain was so severe at that time, even moving over in bed left her in agony. Thanks to this product, she was able to sit up in bed and read her newspaper without screaming from pain. Interested in getting some BENGAY®? Of course you are! It's available at most big chain drug stores, and probably many department stores. I know I've seen it at Walmart as well as Shoppers Drug Mart here in Canada. If you're interested in purchasing it online, click here!